After so many years of styling your own hair, you should roughly be aware of what type of hairdo suits you best. But do you really want to have an everyday look at your wedding? 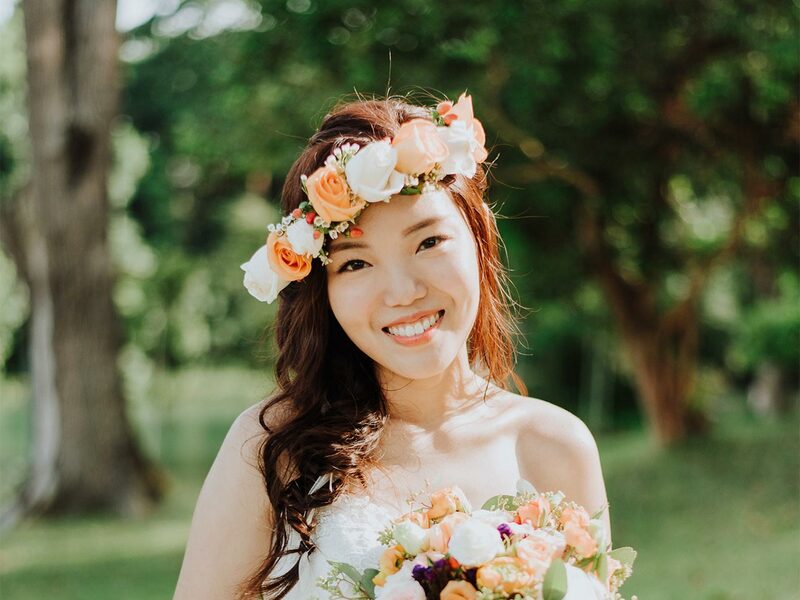 Think of this guide as a way of changing up your everyday hairstyle for a “bridal upgrade” and instead of spending hours to scouring the internet, scroll through these gorgeous hairstyles to inspire both your day and night look! One will never go wrong with a head of romantic waves as this is the reason why it is one of the most popular hairstyles amongst brides! Consider accessorizing with flower crowns, tiaras or other headpieces to complete your look. Get your strands out of your face, but at the same time allowing you to create a romantic hairstyle with the loose, let down hair by adding some curls. Consider highlighting your hair for more visual interests as it helps to accentuate the beautiful curls. Also known as the low bun, is undoubtedly one of the most popular bridal hairstyles to date. This classic hairstyle comes in many variations such as incorporating a twist, braids or flowers. Go for a sleek and classy with a low pony. To prevent your hair from looking too flat, pull out some hair at the back to create a more voluminous look. Add some curls for a more luscious look and keep in straight for a more youthful vibe. Or some may call it the ballerina bun or a princess updo, another classic hairstyle that brides love! Especially brides who are wearing a ballgown, a top-knot would match your princess ballgown perfectly. Turn into Cinderella for a day by accessorizing your hairstyle with a diamond headband. The Bohemian Milk Maid Braid evokes elegance and graceful, yet not losing a sense of youthfulness. Curling the untucked hair gives you an ultra-romantic feels as well! Definitely one of my personal favourites. Slightly different from a princess bun, a french braid is incorporated into the bun (as the name suggests) for a more sophisticated look. If you do not want added weight on your head with hair accessories, then this would a great hairstyle to try out given that the French braid has taken on the role of being the added “accessory”. For someone who prefers letting their hair down but would still like to some stylish designs to their hair, a waterfall braid would be more than suitable for you! Add in some curls and flowers and you are good to go! In case you do not want to entrust your hair to others, then this is one of the doable hairstyles that you can go for. As simple as it may seem, it does not compromise the sweet and lovely look one is able to achieve. A perfect hairdo especially if you are having an outdoor wedding. There’s nothing like some untucked strands and loose side braids to convey the romance of your big day. If you’d like to, add in flowers to level up and create a romantic look like no other! Let us know in the comment section below which are your top 3 favourite hairstyles? Before you hit the “x”, remember to check us out on our website if you’re intending to do a prewedding photoshoot or a photographer for your AD.